Life insurance gets a lot more attention than disability insurance, even though the American worker is three times more likely to become disabled than to die before the age of 65. A disability can strike a healthy person out of the blue. An accident or sudden illness can prevent you from working for years or permanently. 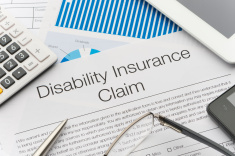 Here are 6 benefits to carrying disability insurance. Most people have set weekly, monthly, and yearly expenses in their household budgets. Rent, mortgage, car payments, groceries, utilities, medical expenses, and a host of other bills are ones we cannot afford to postpone. Unfortunately, when a worker is sidelined, these bills keep coming though the income has stopped. Disability insurance plans cover these expenses, preventing working families from losing homes, cars, utilities, medical insurance, and other necessities. When people get ill or hurt and can’t work, they often have little choice except to take on debt. Provided they have access to lines of credit, they typically find themselves using them for necessities they normally pay for out of their paychecks, like housing, transportation, food, and medicine. Credit cards, title loans, and other emergency money sources come at ruinous interest rates. When individuals are able to return to work, they are saddled with debts that can plague them for years and even decades. Medical issues are the leading cause of bankruptcy in the United States. When medical bills are coupled with the inability to work, disability insurance plans are a necessity. Being without income while medical and household bills mount is a situation most households can’t weather for very long. In a matter of months, all assets can be tapped. Often, disabled individuals must file for bankruptcy protection just to keep a roof over their heads. Disability insurance keeps your income steady, so you can manage your bills and afford to be sick or injured. If you own a home, protecting it with a disability insurance long term plan is as essential as a homeowners insurance policy, if not more so. Most people spend well over $1,000 per month on a mortgage, sometimes several thousand per month. Additionally, they pay thousands in property taxes each year, not to mention all of the money invested in home repairs and renovations. Without a disability insurance long term plan, all of that money invested in the home is at risk. Whether they rent or own, when households have no way to replace income lost due to disability, they often face eviction. Without income, finding a new home can become a problem. Many disabled people are forced onto government assistance or into relying on family members. Some even end up living in homeless shelters. Disability insurance prevents you from falling into this trap. To qualify for SSDI, you must be totally disabled for six months or more. Even if you qualify, your first six months are uncovered and applications and appeals can hold up benefits payments for over a year. Individual long term disability insurance kicks in after 90 days, and you can obtain a short term disability plan to cover the waiting period. SSDI also provides a benefit amount far below the average household’s expenses, whereas individual long term disability insurance replaces a policyholder’s full take-home pay. Individual long term disability insurance also provides coverage if you are unable to work in your normal occupation, while SSDI requires you to lack the ability to work at all.